eCite - Underthrusting at the Hjort Trench, Australian-Pacific plate boundary: incipient subduction? The southernmost portion of the Macquarie Ridge Complex (MRC) comprises the Hjort Ridge, Trench, and Plateau, the topographic expression of the Australian-Pacific plate boundary south of New Zealand. 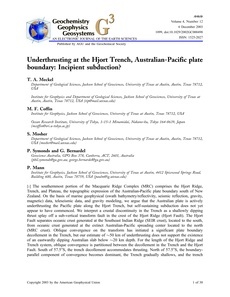 On the basis of marine geophysical (swath bathymetry/reflectivity, seismic reflection, gravity, magnetic) data, teleseismic data, and gravity modeling, we argue that the Australian plate is actively underthrusting the Pacific plate along the Hjort Trench, but self-sustaining subduction does not yet appear to have commenced. We interpret a crustal discontinuity in the Trench as a shallowly dipping thrust splay off a sub-vertical transform fault in the crest of the Hjort Ridge (Hjort Fault). The Hjort Fault separates oceanic crust generated at the Southeast Indian Ridge (SEIR crust), located to the south, from oceanic crust generated at the extinct Australian-Pacific spreading center located to the north (MRC crust). Oblique convergence on the transform has initiated a significant plate boundary decollement in the Trench, but our estimate of 50 km of underthrusting does not support the existence of an eastwardly dipping Australian slab below 20 km depth. For the length of the Hjort Ridge and Trench system, oblique convergence is partitioned between the decollement in the Trench and the Hjort Fault. South of 57.5S, the trench decollement accommodates thrusting. North of 57.5S, the boundaryparallel component of convergence becomes dominant, the Trench gradually shallows, and the trench decollement evolves into a low-angle, oblique-slip fault. The trench decollement and strike-slip system in the Hjort Ridge are structural boundaries that contain tectonic slivers of inferred SEIR crust of the western flank of the Hjort Ridge that currently belong to neither the Australian nor the Pacific plates.